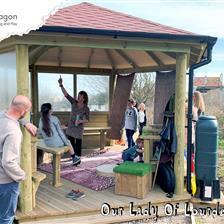 A fun and active source of play was lacking in Severn Beach Primary’s outdoor learning environment. 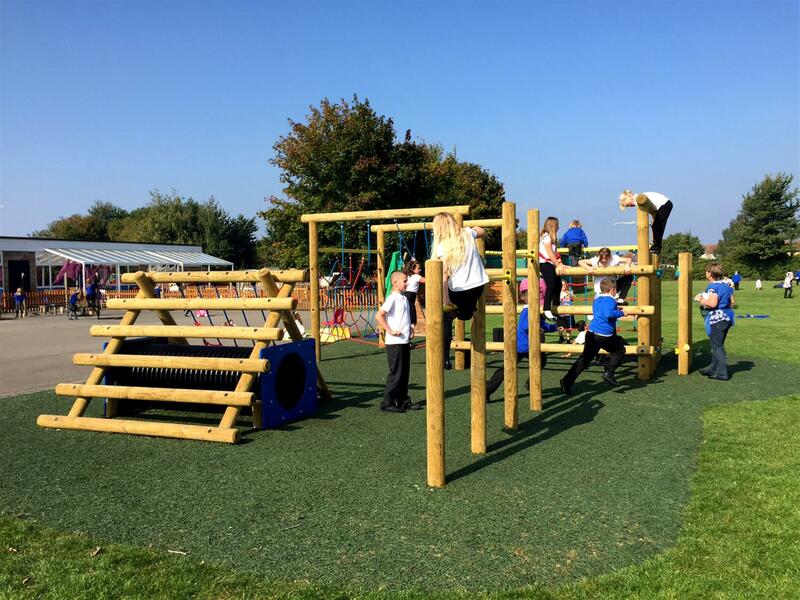 Having a playground that provides both physical and mental challenges, is vital for the development of children, especially those at KS1 and KS2 level. From viewing the area, there was a lack of physical challenges for the children of that age range and as a result, they were using other not-well suited resources to climb and unleash their bundles of energy on. This was a major issues as this could potentially cause the children to injure or harm themselves or others around them. “I think from the school’s perspective the children didn’t have any opportunities to climb, at all. What we had was a small tepee and a little role play area, but the children were using the role play area to climb on which was quite dangerous and not fit for purpose”. 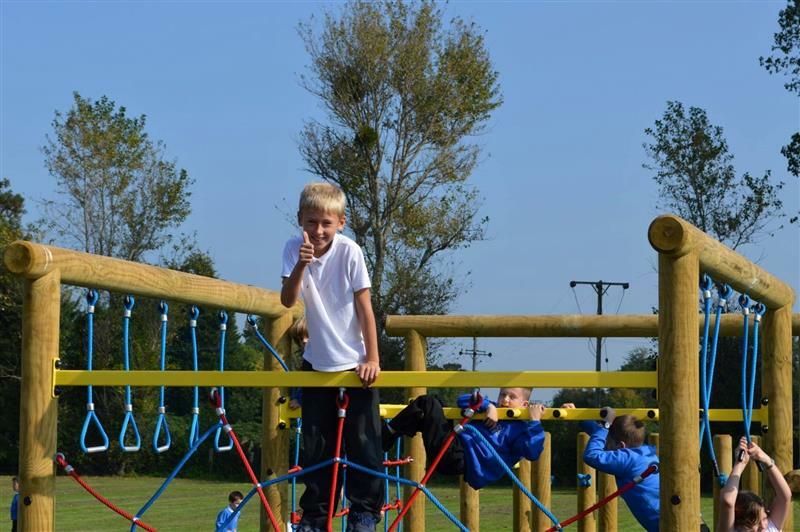 Our play enthusiast, James Collis-Pritchard, worked alongside Severn Beach to provide the school with an area that would challenge the children physically and adhere to the demands that the curriculum has in place. The space we were utilising to develop was very open and at that moment, was not a very appealing place to play. There was no zoning or opportunities for variety in their play to excite and motivate them to partake in fun activities. To tackle the zoning issue and give the children their own play island, we introduced a dark green all-weather Playbond surface. 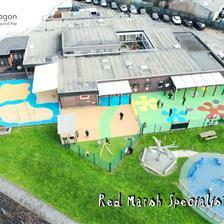 This meant that the area’s floor had a different colour to both the playing field and the tarmac playground, giving it its own special feel. This also means the children now have a variety of play options… they could play sports on the grass field, they could run around on their tarmacked area or now, test their abilities in the newly installed active zone. 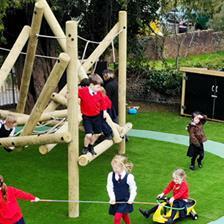 With these active choices, the role play area can now be used for what it was designed for. The next step was to install the chosen Active Play Equipment. The school favoured the Web Explorer which is a fantastic resources that provides 6 different physical challenges. 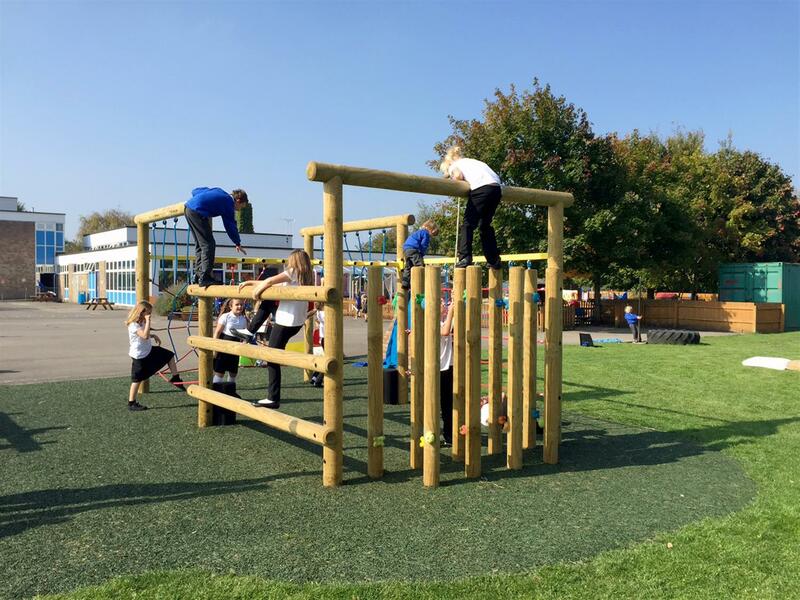 This climbing structure has the capacity for multiple children to use it at any given time, helping to boost co-operation, team work and communication whilst children will use their imaginations to create new situations to play in. For instance, they could become strong monkeys swinging and climbing through the jungle. We also installed our Log Net Climber with Tunnel, as it has its own unique physical challenges. It’s the perfect resource to develop upper and lower body strength as well as gross motor skills that can even further aid children in other educational activities such as handwriting. As always, imaginative play will thrive as it can be transformed into a friendship den, a secret escape tunnel or a treacherous Mountain that needs to be overcome. To go alongside these two active resources, we provided Pull Up Bars to help children build their upper body strength and promote muscle development. This will create a competitive edge as children begin to compare the amount pull ups they can do with each other. We returned to the school to talk to Head teacher Alison Read about the difference the equipment has made to the play time and development of the children. “It has been the perfect resource for motivating the children, it doesn’t just get used in play times and lunch times, we use it as part of golden time and we have small groups going out there, so we are not just limiting it for the children’s free time. It’s a reward”. “Working alongside Pentagon has been a mutually collaborative experience, I felt the children were at the centre of all the decisions being made and I wouldn’t think twice in going back and adding to the equipment”. Do you have an area that needs developing? We are experts in the design and installation of school playground equipment to best fit around your needs and demands. Do not hesitate to Contact Us on or give us a call to speak to one of our specialist consultants.